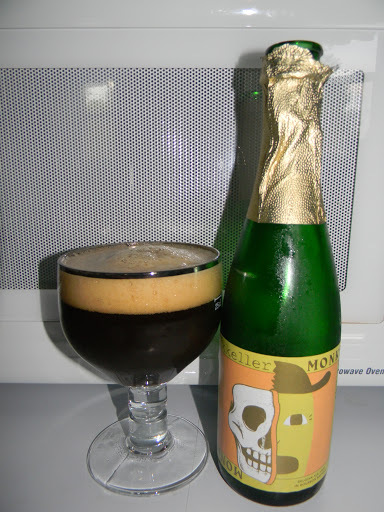 Review of Mikkeller Monk’s Brew (Barrel Aged Bourbon) | Beer Apprentice - Craft Beer News, Reviews, Interviews and Info. Hello everyone. For today’s craft beer review I am, again, going to be trying a brew from the Mikkeller Brewery located in Kobenhavn, Denmark. This particular beverage is the Monk’s Brew (Barrel Aged Bourbon). It has seemed as though I have been getting a ton of Mikkeller stuff lately, so I apologize if they all start to run together. I couldn’t find a specific description of this brew, but be sure to check out Mikkellers website, mikkeller.dk, if you have a moment. This beer came in a 12.7 oz. bottle and it provided an ABV of 10.0%. It poured a cloudy, burgundy/brown color. The crown was khaki colored with lots of small bubbles. Smooth, soft, creamy and sized nicely from a gentle pour. The retention time was suitable and the lacing looked pretty good too. A very attractive beer I thought. The nose provided a pretty significant waft of oak, vanilla and bourbon. Further in I discovered hints of roasted malts and toasted breads. Some distinguishable fragrances of dark fruits along the lines of figs and dates, although they seemed to be somewhat overpowered by the alcohol. The taste administered more of the oak, vanilla and bourbon, however they didn’t seem to be quite as forceful as they were in the bouquet. The dark fruits were a little more harmonized and I even began to discover a minute amount of clove in there as well. The roasted malts and breads really only started to show themselves toward the end of the drink as it began to warm to room temperature. The mouthfeel was medium to full bodied. Rather smooth, dry and chewy. A great deal of warmth was experienced from the relatively high amount of alcohol. It was more felt than tasted I must say. Quite a bit of flavor was left behind on the palate as well. Definitely enough to ponder between sips. Well, this beer was pretty nice. I, personally, think this one could benefit from a couple years in the cellar. Maybe the alcohol would subside a touch and let those dark fruits come forward a bit and really shine. As it sits, it’s most definitely a sipper. I really had to take my time with it. However, I’d still say give the Mikkeller Monk’s Brew (Barrel Aged Bourbon) a try and maybe grab another bottle to put back for a few years. Be sure to let me know your opinion when you try it though. I’d be interested in hearing another point of view.